A few weeks ago, a friend and I had a brief exchange of thoughts on Facebook about Raja Ravi Varma's style of painting. I had said to him that I don't really care much for that kind of artistic work, and an interesting discussion ensued about Indian art, the inner and outer dimension of art, personal aesthetic preferences and a few other things about culture and human motives in life. That exchange sort of inspired this post. I was hoping to go deeper into some of the points my friend and I had briefly touched upon. But as I started writing, the post took on a life of its own and it has now become something totally different. That's okay, I go with the flow. Like I said in an earlier post, I am not an artist. Unless one considers writing that I do on this blog as some sort of "artsy" work. I highly doubt that. But I deeply admire and respect the artistic process that artists, sculptors, poets, creative photographers, writers experience - from that first inspiration to the final work of art they consider as done. At the same time, like everyone else I know, I have my personal preference and taste in art or what I consider artistic. I am not fond of what may be called as realistic art or art that captures reality as is. For me, that piece of art doesn't say much if the only thing it says is an imitation, no matter how good and perfect, of what is found in nature or life. A perfectly done portrait of a person or an inanimate object is not really my preference in art. Where is the mystery, my mind and heart ask. Where is the hidden, my mind and heart search. All bad art comes from returning to life and nature, and elevating them into ideals. Life and nature may sometimes be used as part of art's rough material, but before they are of any real service to art they must be translated into artistic conventions. The moment art surrenders its imaginative medium it surrenders everything. As a method realism is a complete failure, and the two things that every artist should avoid are modernity of form and modernity of subject-matter. Over the last few years I have also come to a realisation that realism in writing also doesn't do much for me either. I am discovering that I don't care much for the kind of writing that is merely a documentation of what is observed or heard or experienced. I used to do such writing as part of my social science research training and professional work. Such writing serves an important purpose in advancing our collective understanding of outer human experience and I know from experience it isn't easy to do. Now I am more inclined toward writing that doesn't merely reproduce the various 'facts' or 'realities' of life and nature as experienced by the subject(s) or character(s) in question. I am touched by the writing that makes room for the unseen, the invisible, the 'un-real' almost. No matter how enjoyable the turn of the phrase and how masterful the wordsmithing, a piece of writing that is only about 'what is' doesn't really move me. I am moved by the writing that seems to invite me to explore 'what isn't but could be', the writing that compels me to 'see' the invisible behind the appearance, to 'hear' the silence between the two audible words, to 'experience' the stillness behind all that is in motion. That's the kind of writing I aspire to do someday. No, not fantasy. Not science fiction. Neither fiction, nor non-fiction. Not abstract philosophy. No, no. O Poet, O Artist, if thou but holdest up the mirror to Nature, thinkest thou Nature will rejoice in thy work? Rather she will turn away her face. For what dost thou hold up to her there? Herself? No, but a lifeless outline and reflection, a shadowy mimicry. It is the secret soul of Nature thou hast to seize, thou hast to hunt eternally after the truth in the external symbol, and that no mirror will hold for thee, nor for her whom thou seekest. I hope to write of life and about life, but life that isn't only lived on the outer surface. I hope to write about nature, but nature that isn't only seen with the outer eyes. I wish to engage in an experience of writing that tries to seize something that is only vaguely expressing itself, or hiding itself, through the outer expression of words, sentences, paragraphs. The writing that engages with the invisible behind the visible, the eternal behind the temporal, the spirit behind the form. 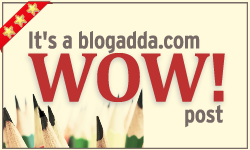 This post has been picked as a WOW post by BlogAdda. The topic this time is - "If I had the Midas touch...."